French-style nonchalance and charm, a touch of Swiss character and ‘down-to-earthness’, historical little towns and ancient countryside makes the Fribourg region a wonderful haven for a holiday. The area is also home to some of the best attractions in Switzerland. Click here to see a copy of the Information Folder in the chalet on all the things to do, see and visit during your stay. Dominating the landscape is the great towering wedge of the Moléson mountain, a jutting chunk of mountain rising to 2000m. Moléson village is a small year-round resort 5km above Gruyeres. Visit the Fromagerie d’Alpage in the village, which is a protected building as it was first built in 1686 and rebuilt in 1827. The farm was renovated in 1990 when it opened as a demonstration cheese-making farm, very similar to the alpine way of life that has been lived for centuries and is still prevalent in the farms all around the area. You can watch a film, see the cheese being made in the traditional manner, in a cauldron over a wood fire, and buy and taste the cheese and other regional products. There is also a small restaurant serving cheese and other local specialities. 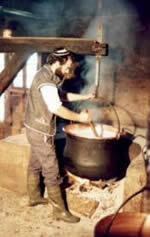 The cheese is made twice a day in a cauldron over a wood fire. Well worth a visit, even if you have visited the cheese factory at the bottom of the hill in Gruyeres too as it offers a good contrast between the modern and traditional cheese-making. This is serious dairy country, the most famous product bay far being Gruyère cheese, is the traditional cheese used to make fondue and the very best fondue is a ‘motie-motie’ (half and half), with half Gruyeres and half Vacherin Fribourgeois cheeses. Running a close second is the world’s best and incredibly thick double cream – just amazing served with the locally-made, wood-smoked meringues. Next to the station at the foot of Gruyères is the Cheese Factory. The cheese here is made daily into 35kg wheels, with each kilo taking 12 litres of milk! Forty-eight wheels are made each day and 36 farmers deliver milk twice a day. The cheese is made three to four times a day, between 9am and 3pm. Up to 48 wheels are made each day. The factory is open daily from 9am to 6pm (7pm from June to September) and there is a useful shop for cheese (obviously), bread, milk and double cream – a must with the wood-smoked meringues – also sold here! Bulle is the local town, about 6 miles/9km from La Taupiniere and has a lovely market on Thursday mornings – worth a visit for all the local produce. Bulle also has a very good museum, the Musée Gruérien, with a good display about the area through the ages and local history, detailing culture and folk traditions, with paintings, furniture, costumes, room interiors and old photos. There are also displays of ‘poya’ paintings – the traditional image of the procession of cows being led up to the mountains in spring. They can be seen on many chalets and farms in the region. 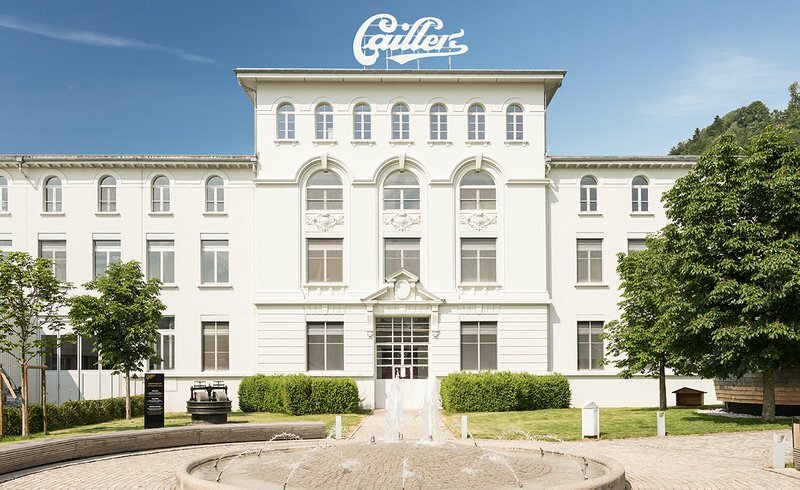 This picturesque little town is home to the best chocolate in the world, so allow time to visit the world-famous Cailler-Nestle chocolate factory. It’s a great visit and the closest you’ll probably get to feeling like you’re Charlie & The Chocolate Factory and loved by children and adults alike. The mountains and lakes, countryside and cities of the Lac Léman/ Lake Geneva region offer so much. There are wonderful little towns and villages along the lake edge and, a surprise to many, the area teams with vineyards on every spare little patch of soil. 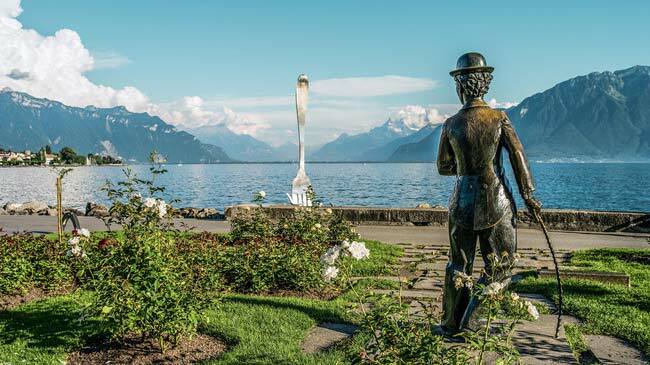 The region between Lausanne and Montreux is now a UNESCO World Heritage Site and has beautiful vineyards and some very pretty towns and villages, such as Lutry and Pully, to explore on the lake shore. 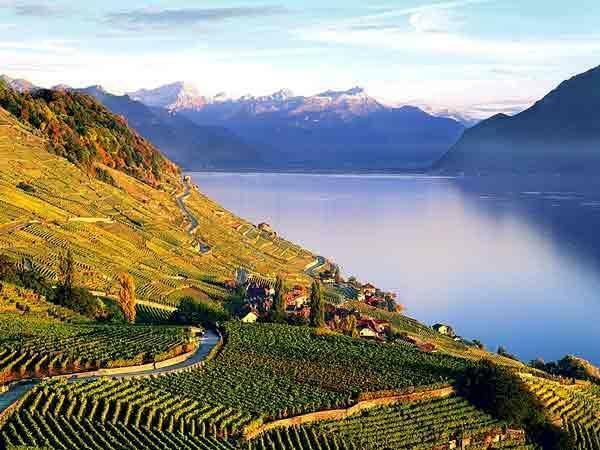 The views from the Lavaux vineyards, set high above Lake Geneva, provide the perfect backdrop for wine lovers. The natural, cultural and culinary highlights of this area are definitely well worth a visit. Vevey is a very attractive town on the northern shore of Lake Geneva (Lac Léman). Numerous celebrities have lived here, including Charlie Chaplin, who spent 25 years here until his death in 1977. The hub of the town is the Grande Place, which is a good place to park. It is very pleasant to stroll by the lake or through the old streets. Vevey is also home to Nestlé, the world’s largest food company. There is a folklore market every Saturday morning in July & August. 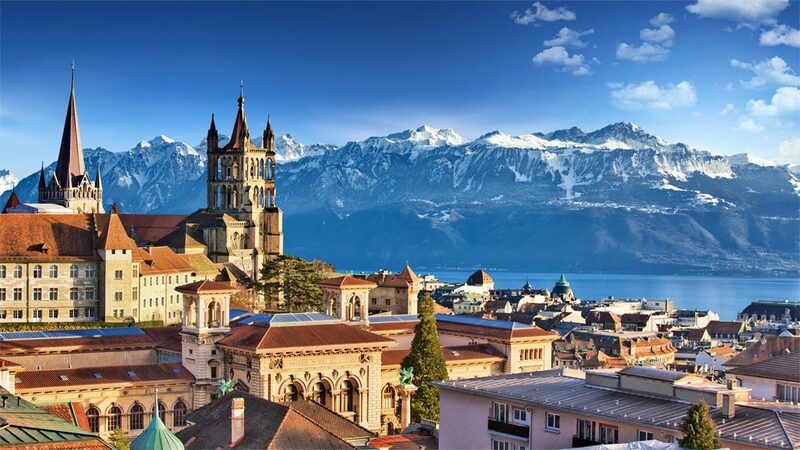 The town of Montreux nestles in a sheltered Lake Geneva bay, surrounded by vineyards and against the breathtaking backdrop of snow-covered Alps. 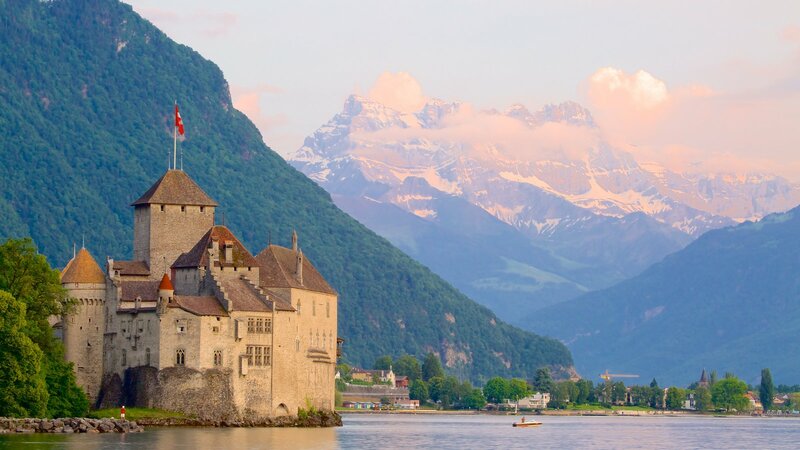 Montreux boasts Switzerland’s most beautiful lakeshore promenade and the famous Chateau de Chillon, with its 1,000-year history – and the most-visited historical monument in Switzerland. The Montreux Jazz Festival, which takes place in June/July and features concerts on a variety of stages and parks is very famous. The city of Lausanne is the fifth largest in Switzerland and is on the shore on Lake Geneva, west of Vevey, towards Geneva. The old town has winding streets and a fine cathedral, considered to be one of the finest medieval Gothic churches in the land, built in the 12th and 13th centuries. Its most striking decoration is the acclaimed rose window from the 13th century in the south transept. Rue de Bourg is the main shopping street. Just west of Place St François de Flon is an intriguing area where formerly derelict warehouses have been taken over by art galleries, trendy shops and restaurants. There is a picturesque fishing harbour at Ouchy and the nearby villages of Lutry and Pully are also very pretty. 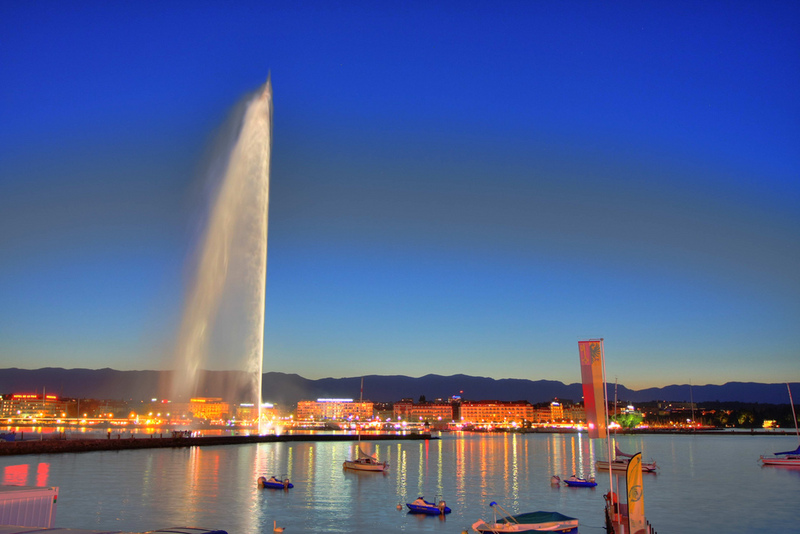 Switzerland’s third largest city, Geneva, sits at the western end of Lake Geneva on the French border. 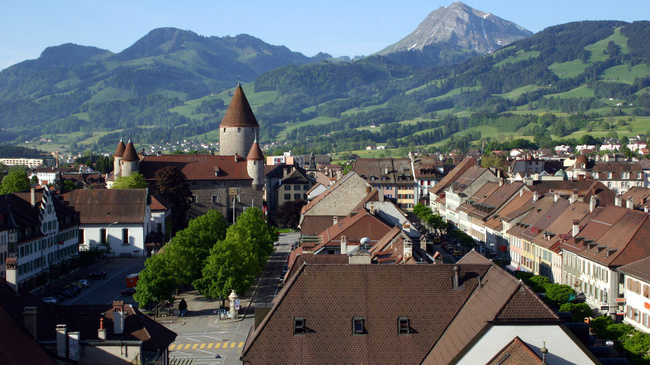 It is a very international city and a third of the residents are non-Swiss. The United Nations European headquarters are here, as is the International Red Cross and World Health Organisation. It is a pleasant place with parks, the lake, mountain views, excellent and varied cuisine. It is also clean, efficient and safe and often has fine weather. The main shopping area is Rue de Rhône on the south bank. The presence of so many businessmen, bankers and diplomats mean prices can be high and you won’t be surprised to see numerous jewellers, watchmakers, banks and furriers. The Jet d’Eau is a jet of water(!) easily visible from the lake shores, forced up at 200kph to 140m high. The Botanical Gardens, near the Rue de Lausanne, have exotic plants, llamas and an aviary and entry is free. Fribourg is the eponymous cantonal capital. 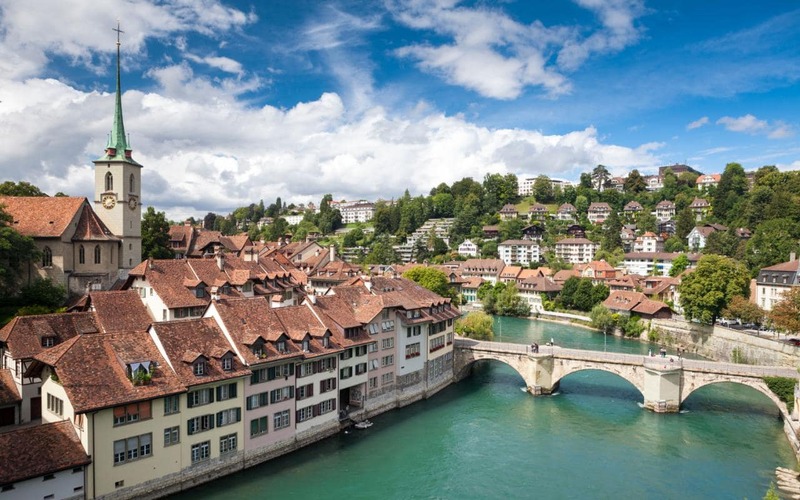 The town is situated on a rocky spur encircled by a bend of the Sarine river, and the deeply sunken course of the river still marks the boundary between the two great ethnic and linguistic areas of Switzerland. Places on the left bank have French names and those on the right, German. The town’s prosperity in the middle ages was based on manufacturing and today many Gothic houses still survive in the medieval town centre. There are some lovely churches and art galleries to see. A walking tour is enlivened by several historic fountains, mostly constructed in the 16th century. St Nicholas, the town’s patron saint, has a fete day celebrated with great pomp on the first weekend in December, both in the town and across the region. There are outdoor markets or participate in the traditional parade. Bern is Switzerland’s capital and the name of the city is apparently in honour of the first animal killed by the founder, Duke Berchtold V of Zähringen, when hunting in the area. The animal was a bear and is still the heraldic symbol of the area and city. The compact town centre is contained within the bend of the river Aare. The city map from the tourist office details a picturesque walking tour through the old town. Most of the walk is Marktgasse and Kramgasse with their covered arcades and colourful fountains. The statues appear every 150 metres and were constructed in approximately 1545. The Ogre Fountain on Kornhausplatz, depicts the unusual subject matter of an ogre devouring small children. Nearby is the Zeitglockentrum, a clock tower on which revolving figures herald the chiming hour. Stand on the Kramgasse side at least four minutes before the hour on the east side to see them twirl. Originally a city gate, the clock was installed in 1530. The next fountain along shows a bear holding a shield bearing the Zähringen coat of arms – which appears on many postcards. There are a number of interesting museums in the city too – such as the Natural History Museum, the Einstein House and the Swiss Alpine Museum. Chateaux d’Oex, the capital of Pays d’Enhaut, is named after an old castle destroyed by fire in the 19th century which donated its choir and bell tower to the present church of St Donat. 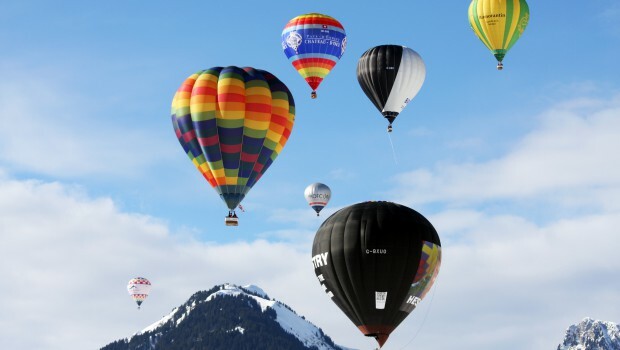 Set in an enchanting position in the Vaud Alps circle, it is the European ballooning capital. Enthusiasts from all over the world meet in these mountains in the last week in January to create an unparalleled spectacle of brightly-coloured balloons gathering for take-off. 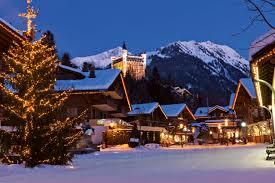 Film stars, celebrities and aristocrats all rendezvous in Gstaad, and it is one of the most fashionable and exclusive mountain resorts on the continent. 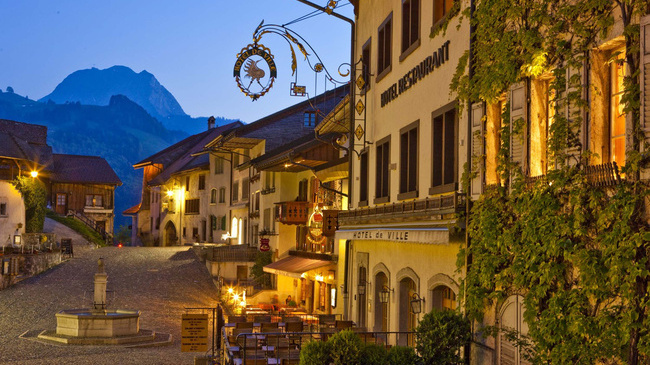 The secret of its charm is that – despite all the big city infrastructure and services – it remains immersed in a setting of unspoilt and rare beauty and has maintained its mountain village appearance, with stone and wooden chalets. Designer shopping, major sports and cultural events and the elegance and high standards of its hotels and restaurants only add to its appeal.